The historic French Village of Akaroa and its spectacular harbour is just a 90 minutes drive from Christchurch. Here you can cruise around an extinct volcanic crater and experience majestic scenery and stunning wildlife on daily harbour cruises. 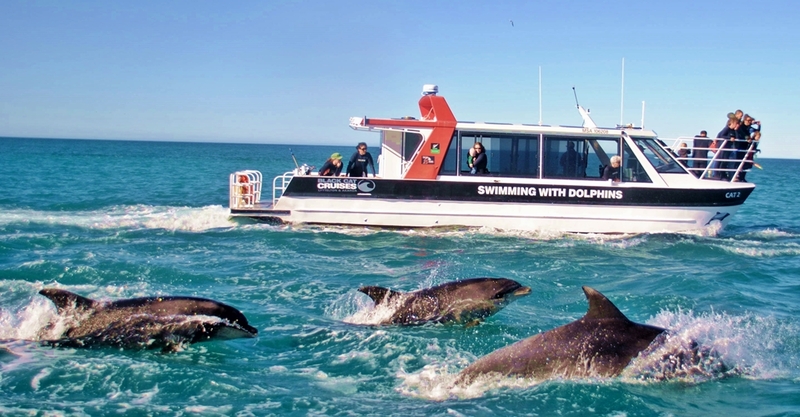 Your cruise is packed with highlights including the rare, NZ native dolphin – the Hector’s Dolphin, as well as penguins and other sea birds. And you’ll see giant volcanic sea cliffs and hear about Akaroa’s fascinating past. Cruises depart every day, weather permitting. Your modern catamaran, the 60 foot /20 metre Black Cat (previously the Canterbury Cat), is perfect for viewing the natural wonders of Akaroa Harbour. Our vessel is the largest and most luxurious on the harbour. Each cruise is fully narrated by your skipper who has extensive knowledge of the nature, wildlife and history of the harbour. The highlight of this trip is undoubtedly the sighting of one of the world’s smallest and rarest dolphins, the Hector’s or New Zealand Dolphin. These friendly and inquisitive mammals meet the boat most days throughout the year and their calves can be seen between October and March. Also on the trip you will catch glimpses of the White Flippered Blue Penguin, the smallest penguin in the world. There are many different bird species in the harbour, including five different cormorant (shag) species and the endangered yellow-eyed penguin. You’ll also see New Zealand Fur Seals sunning themselves on the rocks near Seal Bay. We will stop at Lucas Bay to look at a salmon farm where thousands of salmon from fingerlings to adult fish are farmed in a series of cages. You will see them jumping as we approach the cages. This is where the world-famous ‘Akaroa Salmon’ is raised. On each two-hour cruise we will endeavour to show you wildlife plus the many sea caves and volcanic cliffs. As Akaroa Harbour was a live volcano millions of years ago, there are many spectacular ancient lava flows to be seen. One cliff has a sheer 500-foot face and a fascinating history, while Nikau Palm Gully is the southernmost limit for these tropical palm trees. There is also the incredible Scenery Nook, an amazing pink, purple and red volcanic amphitheatre that will take your breath away.